How do you design a mobile app that will be used by Somali refugees in Kenya? As the senior product manager at aidx, I’ve been thinking about this question and how technology and design are informed by (and inform) a particular time, place, and culture, including those of its designers and customers. We might strive for design that can be used effectively by all people, but there’s also a reason WeChat lets you send money in a red envelope and the International Red Cross has three different symbols for protection during conflict. Additionally, there is a real danger in not thinking about the cultural context of design decisions, which is one way to end up with insufficiently diverse training data and facial recognition algorithms that fail to recognize black faces. In this sense, there is an interesting symbiotic relationship between universalization and contextualization that we need to be aware of. To achieve something close to universal design requires understanding how the design works in radically different contexts. In the end, it’s impossible to remove all cultural imprints from our minds, put pen to paper (or pixel to screen), and voilà, generate a universal design. The perfectly average user is also a fictional conceit. So it’s better to do the opposite: keep lots of really different but specific cultural contexts in mind and develop designs that work in all of them. Exploring different contexts also helps expand our thinking by being open to new influences and conventions. For example, the missed call is frequently used as a signaling communication in countries where airtime is pre-paid. Why waste airtime to say “I’m waiting outside” when a simple (and free) missed call will send the same message? This is turn can influence how we think about the design of the missed call notification. How many reminders should there be that a call was missed? How easy is it to access the list of notifications which include missed calls? There is also significant overlap between this line of thinking about universal design in relation to specific contexts and inclusive design. Inclusive design techniques have generated some great products, but probably aren’t a “new” form of design thinking since they arguably dates back to at least 1808, when the typewriter was invented to help a blind person write more legible letters. Inclusive design means thinking expansively about population diversity. This can be as narrowly defined as making sure color palette selections work for the 8% of the population who have some form of color blindness. But more broadly, Microsoft research found that a majority of computer users would benefit from accessible technology. By default, digital technologies are designed in ways that reproduce existing forms of structural inequality. […] Power reproduces itself through the stories about technology design that we center (design discourse); who we pay to design and develop digital technologies (employment inequity); the imagined ‘end users’ for whom we design the majority of digital technologies (design beneficiaries); the affordances, features, presets, intentional and unintentional biases that we encode into digital technologies (encoded values); the inclusion and exclusion of various kinds of people from the places and spaces where we design digital technologies (design sites); the allocation of decision making power over the digital technologies in our lives (governance), and more. These forms of structural inequality are why I’ve also been thinking about co-design, or designing with, not for. Using this frame, the question becomes “How do you design a mobile app with Somali refugees in Kenya?” Co-design is a powerful framework for bringing people from the communities you hope to serve right into the center of the design process, but the techniques of co-design need to be enacted with some thoughtfulness about process and power. 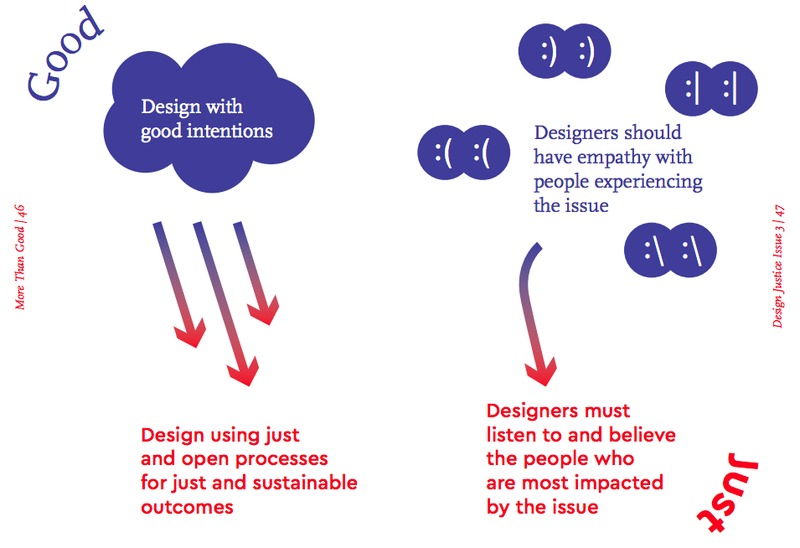 Co-design can help move away from “designing for good” and toward design justice, a key difference noted by Una Lee and others. Co-design is an amazing process. It is an opportunity to step outside of the idea that we are each experts in our chosen domain, and acknowledge that other people can have incredibly valuable insights into a design challenge regardless of their formal training. It acknowledges that intended beneficiaries know just as much, if not more, about how to fix problems they face, but may lack the resources or power to do so. It requires humility and openness. And it can help strengthen community. A final thread in the tapestry of design theory I’ve been weaving here is the “do no harm” principle. We are working with a vulnerable population trying to escape a major humanitarian crisis and widespread conflict. We have to examine how our design efforts may interact with this conflict, and make sure that our explicit and implicit messages don’t feed into it. Our partnership with Conflict Dynamics International has been a valuable resource to help us think critically about this issue. In summary, our approach to designing a mobile app that will be used by Somali refugees in Kenya (and more broadly, using design sprint methods outside one’s own cultural context) involves designing for a specific context that we must understand deeply while simultaneously striving for design that works in many other contexts. It involves being mindful that by selecting a challenging context to explore we could find design innovations that also help people in less challenging contexts. It includes being committed to designing with, not for, and looking for ways structural inequality may be present in our own thinking and processes so that we can mitigate those inequalities as much as possible. And at every step of the process it means striving to do no harm. Interested in the civic applications and consequences of technology.